The aliens residing in the unkempt slums of Johannesburg’s filthy District 9 compound are curious creatures to behold. Gangly and Insectoid - they sorta resemble a questionable cross-mating of Independence Day’s octopus-men with Davy Jones from the Pirates of the Caribbean series – these foreign beings, referred to as “prawns” by the disapproving human populace around them, have spawned a firestorm of political and social commotion since being discovered, malnourished and exhausted, in their disabled gargantuan space craft over two decades earlier. Forcibly confined to a fenced-in makeshift prison located directly under the ever-looming shadow of their damaged ship, a permanent reminder of their inability to return home and escape their day-to-day earthly torments, the “prawns” while away their pitiful hours scrounging through voluminous trash-piles, visiting Nigerian prostitutes and attempting to scrounge up money to support their nagging fix for cat food – an addiction preyed upon by a vicious local crime-lord who has become convinced that consuming the aliens’ flesh will provide him with great powers. 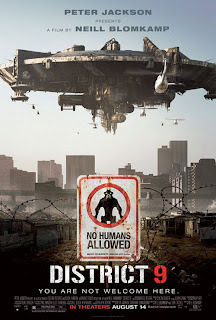 The plight of these unfortunate creatures informs the early sections of director Neill Blomkamp’s intriguing new science-fiction action film District 9, a meticulously constructed Apartheid allegory. Taking a gritty cinema vérité you-are-here-now approach, the director’s heady mixture of flash, wit and grit does wonders for helping sell the authenticity of his alternate reality universe; where intergalactic visitors are as commonplace as stray dogs, wandering nonchalantly and uninhibited around the corners of the frame. So engrossing is the visual wonder of the first-time feature-film helmer’s alien nation that, even when District 9’s cerebral daring gives way to less-compelling pyrotechnic mayhem, our eyes remain hypnotically locked upon his dusty, desiccated war-torn canvas. Before all hell breaks out, however, the film follows the somewhat-bumbling government bureaucrat Wikus van der Merwe (newcomer Sharlto Copley), a jovial member of Multi-National United (MNU) who has been promoted up through the ranks by his domineering father-in-law. Tasked with leading a large-scale relocat ion program, which will transfer the “prawn” population to the inferior new District 10 refuge, Wikus, along with a posse of trigger-happy military escorts, enters District 9 as part of a poorly-planned assignment to collect signatures from the subjugated creatures okaying their own eviction. As fate would have it, though, one of his stops brings him into contact with a “prawn” called Christopher Johnson (voiced by Jason Cope), an alien scientist who has concocted a suspicious chemical substance with dubious properties and purpose. 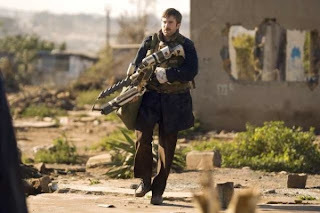 After a clumsy accident leads to Wikus becoming exposed to the mysterious aerosol chemical, he finds himself, much to his anguished dismay, dispossessed and alone, trapped between his own prejudiced society and the frightening and enigmatic world within District 9. 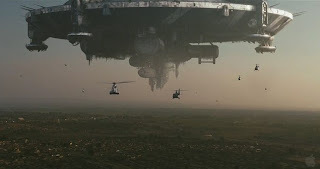 It’s in these early sections that District 9 works best, establishing a recognizable cinematic sci-fi universe through a mixture of fictionalized documentary “talking head” footage and revealing fly-on-the-wall peeks into the MNU team’s journey through the aliens’ pitiful dwellings. 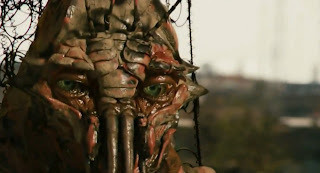 Blomkamp shows remarkable restraint in his effects, portraying his often amazingly convincing photo-realistic creatures in a mundane light, free of sensationalistic mone y-shots and unnecessary focus. Unlike most Hollywood extraterrestrials, the “prawns” actually feel, well, alien, as opposed to thinly disguised humans-in-CG-clothing. By film’s end, they still remain a mystery to us. Where are they from? How does their culture operate? How do they feel about their lowly status and human suppressors? It’s thematically appropriate that these troublesome questions remain lingering in the air after we leave the theatre; for how can a race collectively stripped of its voice properly answer them? To the film’s credit, it also doesn’t go out of its way to make its human character particularly likable or sympathetic. While Wikus is our guide through the movie, he is portrayed in a number of differing lights: as casually cruel, jokingly describing the sound of torched and exploding “prawn” foetuses as resem bling pop-corn, a loving family man, cowardly, friendly, selfish, loyal and, in one particular instance involving an alien ship, irritatingly stupid. 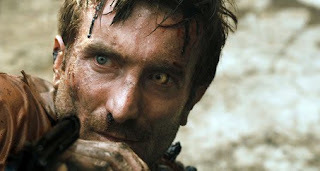 Sharlto Copley, in his debut performance, bravely meets the role’s challenges, crafting a fully three-dimensional character whose Cronenburg-ian odyssey often requires multiple emotions portrayed within a single moment. Even when he’s only delivering an endless string of F-bombs, his un-mannered, improvisational style feels genuine and, most admirably, entirely professional. 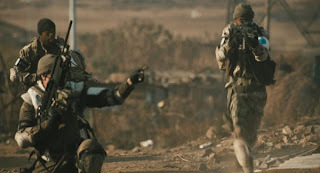 Copley is so good, and Blomkamp so assured, that it’s difficult to not feel slightly crestfallen when, halfway through, District 9 transitions from thoughtful sci-fi parable into an extra-terrestrial-tinged Bourne actioner. Although the shoot-outs and explosions are skilfully directed and technically impressive, they feel remote and uninvolving. In establishing such a carefully modulated tone of realism early on, it becomes difficult to watch characters stand in the middle of intense warzones having heated arguments whilst bullets wiz around them without striking an extremity (or worse). As well, because Wikus has proven to be a somewhat unsympathetic protagonist, it’s hard to truly root for him during his far-fetched flirtations which action-star heroism, such as during an explosive break-in into a clandestine government facility and a climactic brouhaha featuring almost as many fiery detonations and skull-jangling sound-effects as Transformers 2 and Terminator Salvation (Though admittedly done much better.). In the end, the issues at the heart of District 9 just feel too complex and layered to resolve with gunfire and raining projectiles. Ending the film in this fashion robs viewers of the pleasures which a more honest and challenging finale would have provided. The film, and Blomkamp by association, is also far too smart to be lazily relying on the sadistic one-note villains it uses to help fuel the drama. While Mandla Gaduka’s vicious Nigerian crime-lord is effective, projecting a terrifying level of frenzied, possessed barbarism, the same can’t be said ab out some key members of MNU, who seem to act cartoonishly evil for no other reason than to create obstacles for Wikus. Most annoying, it must be said, is the hateful mercenary Koobus Venter (a seething David James) who, like all standard bad-guy heavies, is irredeemably spiteful and, against all odds, survives just long enough to outlive all of his underlings and engage in a one-on-one showdown with the battle-worn protagonist before meeting a comeuppance of violent poetic justice. Venter would be better suited to a James Bond or Die Hard film, not a movie with ambitions towards breaking the mould of blockbuster science-fiction storytelling. Despite its seeming preference for bombast and spectacle over perceptive social commentary, it’s notable that, walking out of the film, I felt more moved and affected by the film’s quieter, more emotional moments; Christopher’s horrified frozen reaction upon discovering the tortures inflicted upon his race, the small alien child picking through scraps outside his shack, the line of “prawns” lined up for food, an appearance of a small metal flower. It’s these parts of District 9, full of attention to detail and even subtlety, which make it a film worth seeing and remembering. 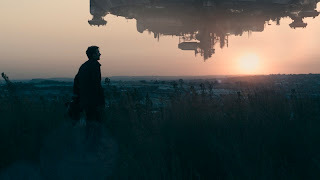 Further, there’s also a tangible thrill to be found in watching Neill Blomkamp, a scrappy new talent on the rise, struggle valiantly and passionately with the material, his sights set, like District 9’s own dejected alien visitors, on the stars and beyond. Though his film falls short of achieving greatness, there are many joys to be found in simply watching him reach. District 9? more like District Nein!